How to help kids stay safer on beaches. The summer sun is here, and we all know what that means, beach time with the family! 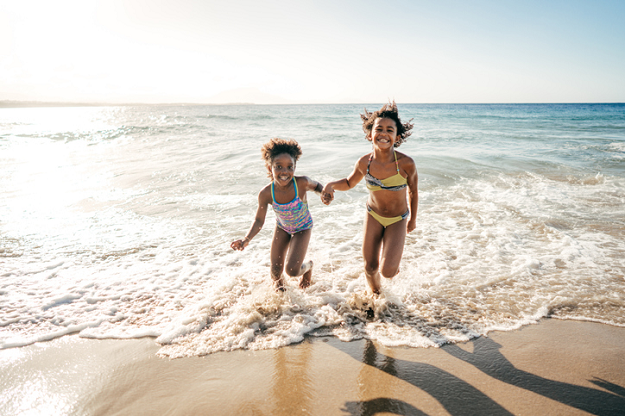 Although many families enjoy years of visiting beaches without incident, there are some hazards worth watching out for. If digging holes for fun, do ensure that they aren’t so deep that a child can be trapped. Don’t dig tunnels with roofs as these can easily collapse. Also, don’t dig where people are walking and fill in holes after playing so that beach-goers don’t injure themselves by falling in. What other tips would you give to beach-going families? Let us know by emailing us at chatback@Parent24.com and we could publish your comments. Do let us know if you'd like to remain anonymous. Only swim where signs, lifeguards or locals suggest is appropriate. Never swim where a sign prohibits swimming. Also, avoid swimming near rocks or where there are strong currents. Avoid swimming where there are boats or where the beach has allocated space for other water sports such as surfing. Ask the locals about the tides and the safest place to swim. If your child cannot swim, accompany your child into the water and don’t venture too deep. Don’t assume that toy inflatables are safe in the water, either. The sea can be very unpredictable and even strong swimmers can get into difficulty in the water. Avoid jellyfish and bluebottles wherever possible. Stings can be very painful! Put up a bright marker or arrange a meeting spot in case you get separated from your kids on a busy beach and make sure your child knows your phone number, just in case. Always ensure that you know where your children are and make sure they know not to stray. It's best that your child be supervised at all times though, so be extra vigilant. Even on cloudy days the sun can burn you and your children. Do put on sunblock and wear clothing that covers as much skin as possible to avoid over-exposure and burning. Even though some kids hate wearing hats, these can help limit sun damage to the face. Bring along an umbrella too, for extra protection. Take plenty of water with you and make sure your kids stay hydrated.